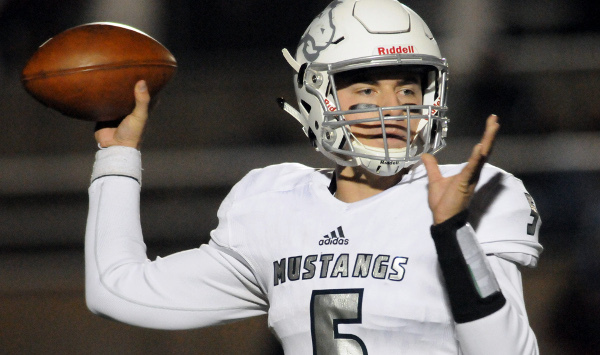 Highly touted quarterback Graham Mertz, a Wisconsin commit, returned earlier than first thought from his Week 3 injury suffered against Pittsburg. Mertz passed for 232 yards and four touchdowns in a 41-16 road win against Mill Valley. After a 0-3 start, Blue Valley North has captured two straight and tallied 93 combined points. Derby’s defense has permitted just 65 rushing yards in five games. The Panthers rolled over Salina South, 60-7, and has allowed just 26 points this fall. Salina Central earned another quality win with a 48-17 victory versus Haysville Campus. The Mustangs led 41-7 after three quarters. Taylon Peters rushed for three touchdowns and 285 yards, all in the first three quarters. SC moved to 4-1 under new coach Mark Sandbo after back-to-back 0-9 seasons. Maize continued its outstanding defense with a 27-2 victory versus Goddard in a matchup of top-five and previously undefeated teams. Maize, ranked third in 3A, had shutout its first four opponents. Goddard, fifth in 4A, was close to scoring, but the Eagles recovered a fumble. The game was scoreless at the end of the first quarter and Goddard took a 2-0 lead on a safety with 8:46 left in the first half. Maize took a 7-2 lead with just under a minute in the first half and scored two touchdowns in the fourth quarter to pull away. In its inaugural season of varsity football, Olathe West picked up its first win with a 40-14 victory against Shawnee Mission West. With three minutes left in the first half, Zac Krause found J.P. Frazier on a 20-yard pass. Alex Birge had a key interception midway through the fourth quarter. Later in the fourth, Krause again threw a TD pass to Frazier, and Reggie Dennis scored for a 33-point margin with 2:48 remaining in the contest. Bishop Carroll narrowly held off Great Bend, 36-33, in a key road contest. Carroll quarterback Cade Becker again suffered injury and exited the game early in the contest. Great Bend led 33-21 after Koy Brack found Dalton Miller on a 35-yard touchdown pass. Then, the Golden Eagles’ Aiden Neidens threw a pass to Gunner Lynch. After a Great Bend punt, Carroll converted a fourth-and-short, and Brady Bockover scored with 2:11 remaining. Great Bend had first-and-goal with 89 seconds left but eventually had to settle for a 33-yard field goal, which missed. Each team is 3-2. In a matchup of great offense versus standout defense, No. 1 Wichita Northwest’s standout attack prevailed with a 55-26 win against Kapaun’s strong defense in Wichita City League action. Northwest led 13-6 at the end of the first quarter on a key 4th-and-8 touchdown pass from Reagan Jones to Kale Patterson. Breece Hall scored five touchdowns. Top-ranked Bishop Miege fell, 14-13, to Rockhurst (Mo.) at home in a highly-anticipated matchup of the two private-school powers. The teams are separated by just seven miles and a history that dates back decades, though they had not played each other since 1986. An estimated 8,500 fans watched the game. It marked Miege’s first loss in 29 games since a 35-28 defeat to Blue Valley in the 2016 season opener. Miege pulled within one point with 6 minutes, 6 seconds left but failed to convert a surprise two-point conversion. Miege quarterback/kicker Sam Pedrotti was tackled a yard short of the end zone. Rockhurst built a 14-0 lead earlier in the game. Wellington moved to 4-1 with a 38-7 victory against Rose Hill. The Crusaders kicked a 26-yard field goal, the team’s first made field goal since 2010. Prairie View defeated Burlington, 28-0, and took control of Class 3A, District 2. The Buffs led 21-0 at halftime. Prairie View (4-1) has matched its win total from last year, a season that included a 40-26 loss to Burlington. District 3 had some separation in a district with four winning squads and five teams with at least two victories. Topeka Hayden defeated Jefferson West, 30-7. Perry-Lecompton won at Santa Fe Trail, 28-6. The Kaws and Hayden are 2-0, while Jefferson West and Wellsville are 1-1 in districts. Santa Fe Trail and winless Bishop Ward stand at 0-2. In District 1, Frontenac held off previously undefeated Parsons, 7-6. The Raiders scored on a Ryan Raio 1-yard run with just over two minutes left. Frontenac held the explosive Parsons offense scoreless, with the Vikings only points coming on an interception return by DaQuan Johnon. The Raiders moved to 3-2, 1-1, while Parsons went to 4-1, 1-1. Also in District 1, Galena won a high-profile contest at Caney Valley, 34-16. After the Bullpups struck for the game’s initial points, Galena scored 34 consecutive points to take a 34-8 lead. The Bulldogs remained undefeated at 5-0. Pratt continued to be impressive with a 42-0 road win at rival Kingman. The Greenbacks have posted three straight shutouts and have four shutouts this season. Pratt avenged last year’s Week 9 loss to Kingman that kept from the Greenbacks from making the playoffs. In the previous two years, Pratt was a combined 19-3 with a state title but had just one shutout. The last time the Greenbacks had even back-to-back shutouts was Weeks 1-2 in 1998, an eventual 10-2 year, according to Kansas Football History. Scott City and Maize were the only teams that had not allowed a point entering Friday. Scott City gave up its first points with a 56-7 victory against Russell. The win marked an historic 600th for the Beaver program. The Beavers led 28-7 after the first quarter. Hesston standout quarterback Cameron Cox hadn’t played this season because of injury. He returned and helped the Swathers halt a two-game losing streak with a 38-22 home win against Halstead. Phillipsburg’s Jon Hunnacutt drilled a 52-yard field goal at the end of the first half to put the Panthers up 38-0. Hunnacutt, nearing the state record for career kicking points, easily set a new career high for longest field goal. He helped Phillipsburg cruise to a 45-0 home win against Thomas More Prep in District 8. In District 6, Hutchinson Trinity (4-1, 1-1) scored a key 20-7 upset of Garden Plain (4-1, 1-1), consistently ranked in the top-five in the classification. The Celtics had defeated Ell-Saline in Week 4 and played Conway Springs close last week. Trinity led 14-0 after the first quarter when Kaleb Hammeke returned the opening kickoff 90 yards for a score and threw a seven-yard touchdown pass. Garden Plain outgained Trinity, 222-166, but the Celtics were plus-1 in turnover margin. Belle Plaine defeated Neodesha, 33-27, in double overtime, its second overtime game this year. No team scored in the first overtime before the Dragons scored the winning points in the second OT. In Week 1, Belle Plaine lost at Inman, 37-36, in overtime. The Dragons have captured three straight victories, including a 41-40 home win versus Cherryvale in Week 4. Belle Plaine, with first-year coach C.J. Madison, has already recorded its most wins in a season since 2011. Pleasanton, an eight-man team for the last several years, bumped up to 11-man this fall and continue to impress with a 5-0 start. On Friday, the Blu-Jays rejoined the eight-man ranks with a road game at Osceola (Mo.) with a 38-22 victory. Pleasanton has captured eight straight regular season wins. Centralia earned its third straight victory by getting past Troy, 36-22. The game was tied at 14 at halftime. Troy led 22-21 with 4:15 left before the Panthers tallied two late scores. Centralia went up 29-22 and then had a big interception and rushing TD for the final margin with two minutes left. Jackson Heights held off Valley Heights, 22-14, in another key 1A game on the east side. Jackson Heights led 8-0 with 2:10 left in the first half on a 2-yard run from Conlan Bruggeman. The Cobras led 14-8 going into the fourth quarter and the game was tied at 14 with 7:37 left. Valley Heights scored but couldn’t convert the 2-point play. With 48.8 seconds left, Jackson Heights had fourth-and-goal at the 2-yard line. Kolby Rethman scored on the next play, and then the Cobras picked off a pass to earn the victory. Smith Center rolled over Oakley, 42-0, at home, but the night was memorable because legendary Redmen coach Roger Barta was elected into the KSHSAA Hall of Fame during a halftime presentation. Northern Heights beat Lyndon, 21-12. The defense only allowed six points as the other touchdown came on a fumble recovery for a score. It ended a nine-game losing streak versus Lyndon that dated back to 2009. In St. Francis, the host Indians upset top-ranked and defending state champion Hoxie, 64-30. Hoxie is 16-2 in the last two seasons with both losses to St. Francis. Hoxie has now dropped nine straight to the Indians dating back to 2004. Hoxie dropped to 4-1, 1-1 in District 8. In WaKeeney, Leoti-Wichita County scored 50 points in the second quarter and won 58-12 in a game that ended at halftime. Both teams entered a surprising 3-1. Leoti quarterback Kayde Rietzke rushed for 106 yards and passed for 77. Jesse Gardner tallied 186 rushing yards behind great offensive line play. Both players rushed for three touchdowns, and Rietzke passed for a score. Rietzke did leave the game with a stinger in the second quarter but is expected to return next week in a big home matchup against St. Francis (5-0, 2-0). Oswego moved to 4-1 in the first-year of the Matt Fowler era with a 48-44 road win against West Elk. Oswego is 1-1 in District 1 play, while WE moved to 1-4, 0-2. West Elk missed its top-two backs in William Silvey and Nic Moreno. Last week, Moreno was lost for the season versus Central Burden with ligament damage. Oswego outrushed WE, 328-169. Jace Wilson scored seven touchdowns (six rushing) of 45, five, five, 49, 15, 10 and 75 yards. He helped Oswego bounce back from a 14-0 deficit after the first quarter. Oswego has not won more than four games in a season since 2010. In District 2, Udall pulled a minor upset with a 22-14 victory against Argonia-Attica, the first meeting between the squads since 2013. Both teams were tied at 14 at halftime. Five squads in the district have winning records. South Central and Caldwell are both 2-0, while Medicine Lodge and Udall stand at 1-1, and Argonia-Attica is 0-2. Udall has two wins in the last three weeks by a combined 12 points sandwiched around a 36-0 loss to South Central. The last three games have all been on the road. In District 1, Cedar Vale-Dexter (4-1, 2-0) earned a key, 64-32 win against previously undefeated Sedan (4-1, 1-1). Last year, the Spartans lost to Sedan, 44-0. It marked the first time Cedar Vale-Dexter beat the Blue Devils since in the last four meetings. The Spartans were 1-6 in the last seven meetings versus Sedan. Clifton-Clyde and Victoria matched up for the first time in school history in a key District 7 contest. Clifton-Clyde took advantage of some Knights’ mistakes before the end of the first half and led 30-18 at the break. The Eagles eventually won 54-30 and remained undefeated. Sylvan-Lucas made a big home comeback to defeat Thunder Ridge, 52-48. Thunder Ridge led 40-24, at halftime, and 48-38 with 10:33 left before the Mustangs rallied for the victory. Both teams are 3-2, 1-1 in a district with little separation. Southern Cloud ended a nine-game losing streak with a 54-30 victory versus Lakeside-Downs. Carson Bellows rushed 20 times for 155 yards and two scores. Blake Gumm had 12 carries for 152 yards and four TDs. SC lost the final five games of last year and the first four of this season before the District 4 win. Ashland defeated Moscow, 46-43, with another key six-man victory. Both teams are in their first year of six-man football. Ashland stands at 4-0 after a 67-21 victory versus Pawnee Heights two weeks ago. Ashland and Golden Plains (5-0) remain undefeated. Ashland defeated Natoma, 63-14. Ashland and Golden Plains don’t play each other in the regular season.